Before trying out our Freeva nappy I was a cloth nappy virgin. Ever since having Noah I was toying with the idea of trying cloth. When I saw the PR request asking if any bloggers would like to test out a Freeva cloth nappy I inquired straight away, this was our chance! I was offered a variety of different nappies to choose from but I decided to play it safe and go for Snowy white, after all what's cuter than a little baby in a bright white nappy? One size. They fit both babies and toddlers from 6lb to 33lb. Made out of waterproof fabric on the outside and soft fabric inside. All Freevia nappies are supplied with 1 microfiber insert. The waistband is fastened with velcro. Poppers to adjust the height of the nappy. Come in a wide variety of colours and patterns. On arrival I loved the quality. I had nothing to compare it to but I wasn't expecting it to feel as good as it did. I envied Noah's botty for being able to wear something so soft! Freeva nappies come with a set of instructions which was a god send for a newbie like me. I wouldn't of had a clue about pre washing them and probably would of put the nappy straight onto Noah which would of been a big error. Pre washing the nappies a couple of times enhance the absorbency. 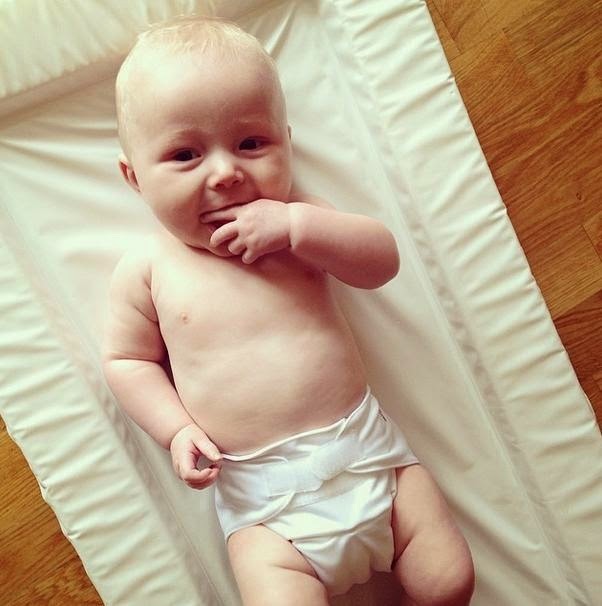 Our very first experience with a cloth nappy was very positive. Not only did Noah look absolutely adorable kicking about in cloth but he also looked very comfortable too. He was in the nappy a little longer than I planned as he ended up taking an unexpected nap in his pram so it did leak around the legs but that was after 3 hours. That being said I was very impressed because the nappy only had the one insert and Noah is also a heavy wetter. I have to add how easy they are to wash and dry too which is important to us parent's. My only negative is that it would be better if Freeva nappies were supplied with two inserts rather than the one. That is my only niggle. Freeva not only provide a whole range of different nappy designs but they are also excellent quality and at a very affordable price. I am already contemplating buying my very own Freeva starter kit because we love cloth! If you fancy trying cloth yourself then Freeva could be for you. Enter CHICGEEKDIARY at the checkout to get 5% off your order. You can use the voucher code as often as you like, so tell your friends too! Have you tried cloth? What did you think? I was sent this nappy for the purpose of this review. However all opinions are my own. We tried out a cloth nappy, and he was wet through half hour later. I can't get my head around cloth nappies, I'll stick with my disposable nappies!